Nightingale Breads was founded in 2008 by Beth Thorp, who after nursing for 22 years changed careers and found a new calling. Renovating a building previously known as a real estate office, she re-imagined the space into a rustic bakery complete with a wood fired oven. The bakery has slowly built it’s success over the years, becoming a must stop in Forestville, frequented by Sonoma County locals and visitors. In 2018, after 10 years of hard work, Beth was ready to hang up her apron. Then employee, Jessie Frost, decided to take up the mantle and purchase the business. Jessie, raised in Sonoma County, found a passion for baking as a young adult and set out to hone her skills. After receiving a baking and pastry certificate from Santa Rosa Junior College, she got to work learning the craft, at home and on the job. 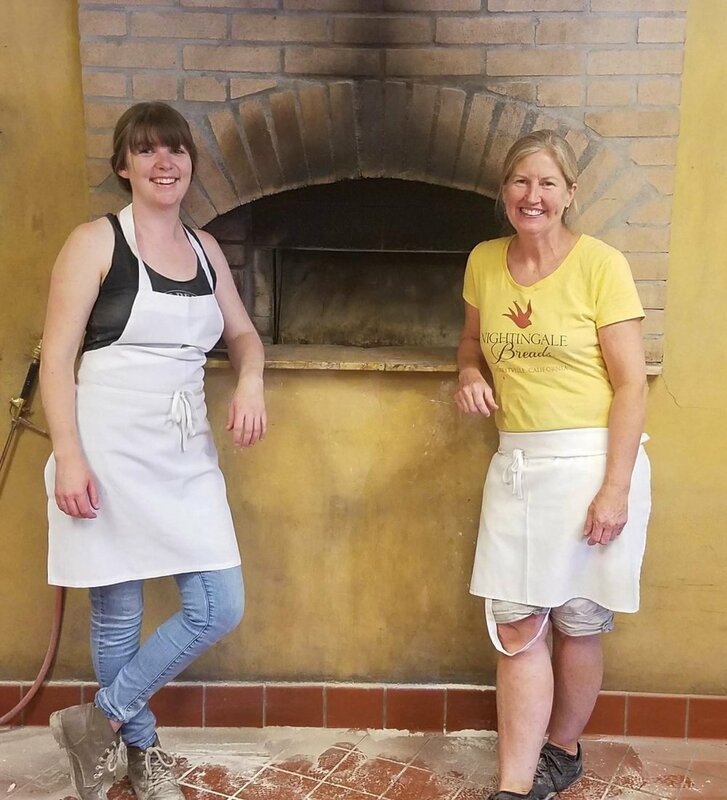 With 10 years of baking experience, most notably at Brickmaiden Breads in Point Reyes Station, Fat Angel Bakery in Fairfax, and almost 3 years at Nightingale working closely with Beth, she is ready to lead on. The main focus for Nightingale is hand made, organic breads. We make everything from scratch, with great care and dedication. Baking bread is a labor of love: sometimes meaning long hours, early mornings, heavy lifting, but it’s all worth it for that moment that we pull beautifully browned loaves from the wood-fired oven, and to hear the delighted reactions of our customers and friends. We are happy to be a part of this amazing place in California, to employ hard-working and creative bakers, to work with local restaurants and producers, and to supply the people of Sonoma County with simple, fresh, wholesome breads.